The fourth annual Hackney Cycling Conference, organised by Hackney Council with help from the Hackney Cycling Campaign, took place on 5 June 2015. This year the event was supported by Steer Davies Gleave, L&Q, Transport Initiatives and Cyclehoop, and took as its theme “the economics of cycling in world-class megacities”. Speakers included the internationally recognised Andy Clarke, President of the League of American Bicyclists (Washington DC, USA), Rodrigo Guerrero Maldonado from Steer Davies Gleave (Mexico City, Mexico), Dr Robin Lovelace from the University of Leeds (UK), and Liesbeth van Alphen, Mobycon (Netherlands). As in previous years, Andrew Gilligan, London Cycling Commissioner for the Greater London Authority, was also invited to speak, and this post focuses on the update he gave at the conference. 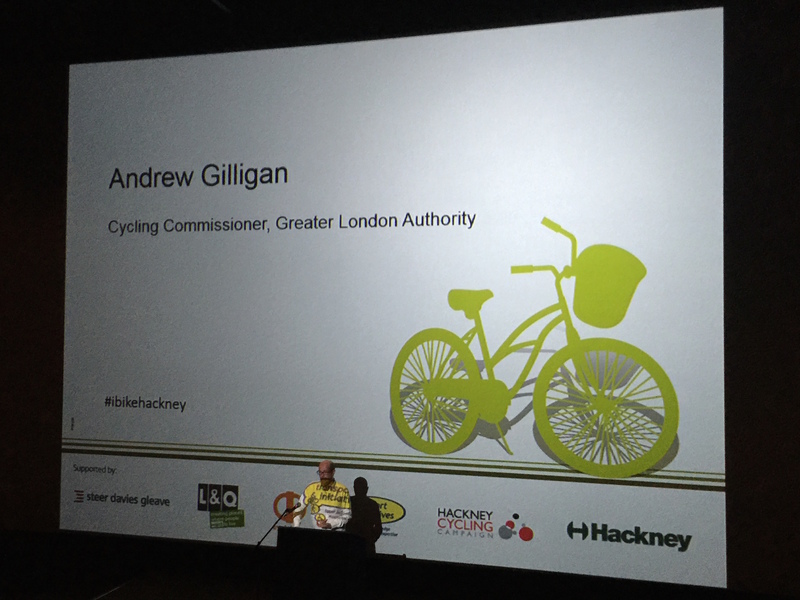 Andrew Gilligan, Cycling Commissioner, Greater London Authority, takes to the podium at the Hackney Picturehouse, London, looking as though he is wearing a Transport Initiatives sponsored shirt! The Cycling Commissioner began by saying that the last twelve months had been a test of strength, just as he had predicted would be the case a year ago. Cycling projects in central London had initially faced some very strong resistance and lots of objections, many of which had started with the words “of course, I support cycling”. Nevertheless, in terms of the most difficult schemes, the plans had largely prevailed. As a result, four segregated cycle superhighways were currently being constructed, along with improvements to around 15 junctions. The first back street Quietway route was being built, and another seven of these “stretching out to the far reaches of outer London” would be delivered by 2016. By this time, another twenty, or so, would be in progress. Gilligan acknowledged that there had been a huge amount of help from cycling activists, cycling bloggers and cycling groups. In particular, he praised Chris and Jono Kenyon, co-founders Cycling Works, for harnessing business support. Public backing had been important too, with 84% of respondents to the consultation in favour of the proposals. In the recent months though, it had been the sustained support and political pressure from the Mayor, from Isabel Dedring (Deputy Mayor for Transport), from technical staff at TfL, and from Gilligan himself, that had prevented these projects from failing. Andrew went as far as to say “you will have to wait for our memoirs… to find out how difficult it was, and how close it all came to not happening”, before noting that it’s still not quite over! One reason for highlighting the difficulties that had been faced, continued Gilligan, was to focus our minds. A Mayoral election is less than a year away, and he posed the question ‘what will happen after that?’. “It seems to me that the crucial factor in making cycling improvements is political leadership”. Gilligan declared that most of the planned cycling infrastructure and super-highways projects from TfL were secure and would be finished, but the borough-led programmes, the Quietways, the central London grid, and the mini Hollands were a much more mixed picture. Again, it came down to political leadership. (The need for political leadership is something that many, of course, have said on many times before. The International Cycling Infrastructure Best Practice Study of 2013 reported political leadership as the key ‘common condition’ found in cities that had experienced significant growth in cycling’s mode share). The cycling commissioner had particular praise for the Waltham Forest mini-Holland, describing it as “absolutely terrific”. But whilst some boroughs were doing absolutely superb work, others appeared not to be terribly interested. “Any deficiencies you may notice, and I think you may notice a few in the network of routes on our borough roads, are not on the whole for want of trying by us. They are there because we have not been able to persuade the borough concerned”. Traditional thinking, like “cycling on pavements” and “toucans”, still persists. There is also still a certain amount of over-specification, money being used for public realm that “tarts-up the street” but doesn’t actually do a great deal for cycling at all. “We fought a lot of that back, but that’s still the way of thinking in some parts of London”. Cycling on pavements? Surely the cycling commissioner was not thinking about Green Wrythe Lane in Carshalton? He could well have been, because Green Wrythe Lane was, and is, being specifically funded from dedicated cycle funding. As to public realm, the commissioner was probably not referring to any of the Outer London Fund projects that have taken place in the borough over the last few years (Wallington, North Cheam, Worcester Park and Hackbridge). Nevertheless, these schemes, largely funded by Transport for London with a focus on regeneration, could easily be placed in the “not having done a great deal for cycling” category. They could actually be placed in the “marginalisation of cycling” category. The fact that most of these schemes were finalised prior to the publication of the Mayor’s Vision for Cycling is not really an excuse for this. Gilligan was clear to point out that enormous and unprecedented progress had been made over the last two years. But then he added “I do believe that we are still in the foothills really when it comes to making London a cycle friendly city”. The task is to ensure that the progress that has been made continues after May (2016). The impact on traffic during the construction of the central London segregated routes has been small. If, on completion, people see that the traffic hasn’t melted down, and it is not the end of the world, it will become less difficult to do more routes like that in future. Although the Cycling Vision for London, launched by the Mayor two years ago, has broad, cross-party support, the commissioner noted there was the possibility that whoever is elected as Mayor in May 2016 may not care quite so passionately about cycling as Boris Johnson. This could bring the risk of a shift in political focus, and it was important that the new mayor did not make the mistake of thinking that transport investment is a zero-sum gain in which any investment for cyclists comes at the expense of everyone else. The commissioner went on: “Most schemes we are doing for cyclists also have huge benefits for almost everyone else. Clearly, cycling investment can get people out of cars in ways that pedestrian investment can’t for those journeys that are not practical on foot, and getting people out of cars gives improvements for pedestrians enormously too. It gets people out of buses and trains too, where there is an urgent need to create more space”. The commissioner also noted that after the election there is likely to be a break in continuity in personnel (with Isabel and himself both, quite possibly, being marched off the premises and security passes taken) and that new people would start from a lower knowledge base. Consequently, a task for campaigners is not only to secure the same commitment from the new mayoral candidates as we successfully secured from the current mayor, but also try to secure some continuity in the personnel. Figures released on 4 June 2015 (the day before the conference) had shown that there had been a 5% rise, year-on-year, in the total number of cycling journeys in London; with a 11% rise in cycling on Transport for London main roads (bringing cycling on these roads to the highest level ever recorded). These figures demonstrated the need to continue investing in cycling, to continue the ten-year investment program. “You only have to look outside this building, or any other building in London, just to see how astonishing are the numbers of people go round by bicycle”. [True in parts of Hackney and central London, but alas, not the case in Sutton]. Gilligan concluded by saying that he understood the impatience there has been over the last couple of years in the pace of progress. However, in the next six months or so we will start to see the first sections of segregated cycle super-highway, including Vauxhall Cross in about six weeks time. The task now is to make sure things keep happening after May 2016. Earlier in the day, Andy Clarke, President , League of American Bicyclists, had delivered his presentation entitled “Making the economic argument work”. 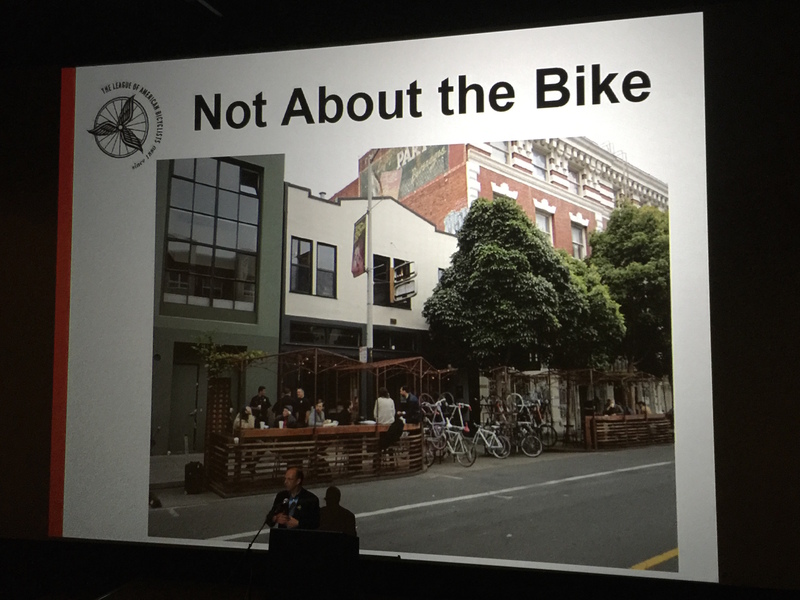 This slide reminds us that is not just about the bike. The full presentation, including “The Ultimate Number”, can be downloaded from the link provided towards the end of this post. Andrew took some questions from delegates. Many of the questions were asked through Twitter, and there was not time for everyone who used social media to have their question answered. Fortunately for me, the first question was mine (via Twitter @chasinzone5)! To what extent can Transport for London influence boroughs to spend their limited Local Implementation Plan cycle funding well? Local Implementation Plan (LIP) funding is the process through which TfL provides financial support to boroughs for schemes to improve their transport networks. See LIPs guidance at TfL. Gilligan answered by saying that this was at least half of his job. He thought it had been partially successful, and many boroughs “get it”, but some boroughs still had “old-style thinking”. In terms of the LIP, all boroughs are guaranteed a certain amount of cycle funding. However, in terms of the cycling budget, boroughs are not guaranteed anything. Put simply, if boroughs are not “prepared to do things properly” TfL can, and will, refuse to give additional funding. “As I have said right from the beginning, I would rather do nothing than something useless”. The commissioner went on to say that when it comes to the LIP funding, in the end, it’s up to the borough. He could not force them to do things, or send in the troops to occupy the town hall! However, TfL had been working extremely hard to make sure that there are proper standards of provision in the Quietways and the central London grid. Gilligan concluded his answer by mentioning a power in the Greater London Authority Act (1999) that allows the Mayor to take control of any road in London. (Noting that councils control 95% of London’s roads). This power had been contemplated in one or two cases on the cycle superhighways due to considerable council opposition (even though this requires the agreement of the Secretary of State). In the end though this had not been needed. The cycling commissioner suggested that it might be worth asking mayoral candidates whether they would be prepared to use this power in the future. It was pleasing to hear the commissioner make the point, once again, that bids made by boroughs for additional cycle funding would be subject to scrutiny. That is exactly how it should be, of course. All councils need to take note. The point I was trying to make in my question, though, related to the guaranteed LIP funding. What I had really wanted to know was whether it was time to make the LIP allocated cycle funding also subject to certain conditions, i.e. for funding to no longer be guaranteed, but only allocated for schemes that comply with, or exceed, the guidelines of the new London Cycling Design Standards (effectively a “sanity check”). My interpretation of Gilligan’s repeated, and welcomed, confirmation that TfL can refuse to give additional funding streams to boroughs that are not prepared to do things properly really comes down to the following. Firstly, boroughs have to be able to demonstrate that they understand what is required. And secondly, boroughs need to provide sufficient evidence that they are capable of rising to the demands and challenges for making the case. After all, enabling stress-free, safe and enjoyable cycling, that everyone can benefit from, will only be a reality on our streets when there is the local political-will to make it happen. However, as we are seeing in Sutton, when it comes to LIP funding, and allocations being spent on converting pavements to “cycle-ways”, the borough has yet to catch-up with new thinking. Furthermore, the poor lack of support by councillors to the London Cycling Campaign’s Space for Cycling ‘ward asks’ in 2014 (19%, the lowest of any London borough with the exception Hillingdon and Bexley) would suggest that political buy-in by the council is weak too. Taken together, and frankly it is difficult to be too optimistic about the future for cycling here in our borough. It remains to be seen whether the eagerly awaited Cycling Delivery Strategy for Sutton will signal changes. Let’s hope so. You can read more about Sutton’s LIP funding for the current year in Sutton Cycle Funding 2015-16. 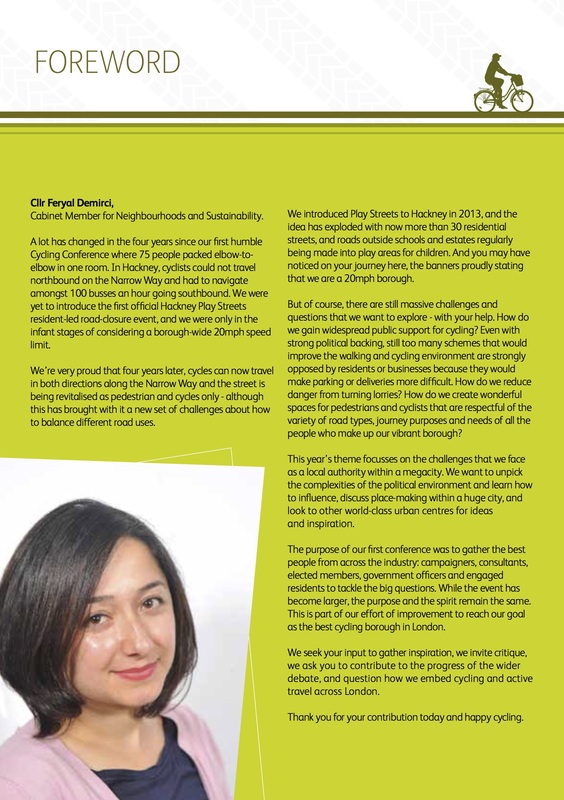 The foreword to the Hackney Cycling Conference 2015 programme, from Councillor Feryal Demirci. Hackney Council clearly recognises and understands the challenges that need to be addressed when endeavouring to create wonderful spaces for pedestrians and cyclists that are respectful of the needs of all the people in the borough. For the wider debate to be successful, all of London’s local authorities need to be asking these questions too. The second question came from Gerry Matthews, Tower Hamlets Wheelers. Will the delivery of Quietways in 2015/2016 be aimed at the potential cyclist in the community, or will it be catering solely for the current commuter cyclist? Andrew reaffirmed that Quietways were aimed at new cyclists, and for people who would rather not cycle on the main roads. Some commuters may find them as an absolute revelation too! He explained that part of the difficulty with Quietways was that a lot of councils, councillors, and local politicians think that Quietways will be like cycle superhighways, with “great phalanxes of young people in lycra charging through their parks”. That isn’t the case, and it had been necessary to explain that the Quietways will be slower and more suitable for people who want to take it easy. Jon Fray, Kingston Cycling Campaign, had a question about the progress of mini-Holland in his borough. 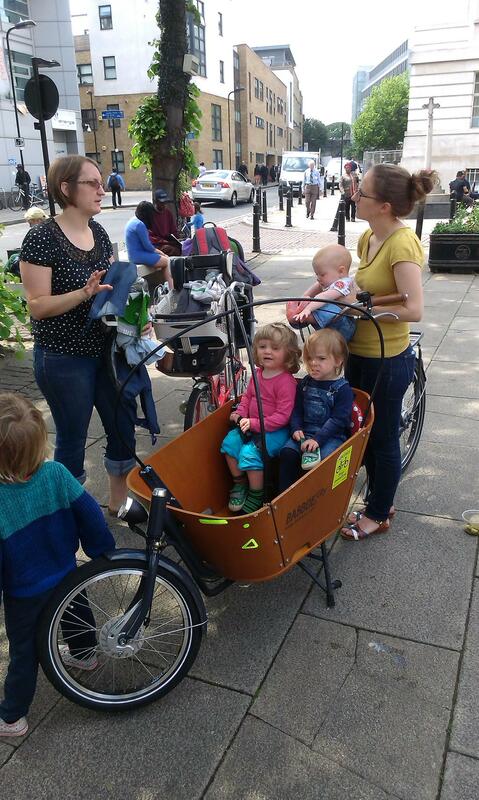 Why has Kingston not delivered anything from the mini-Holland programme? Andrew believed that the change in administration in the council elections last year had led to a loss of momentum and to the production of some schemes that were not good enough. The pace had subsequently picked up, and progress was now going extremely well. In noting that people will always oppose changes, Andrew said that the test was how well any unjustified opposition was managed and overcome. Kingston was doing well on this. Hackney campaigners and Hackney Council were not impressed with the plans for the Old Street roundabout. What is you opinion of the proposal for Old Street junction? Hackney campaigners and Hackney Council don’t think it will make cycling safer. Andrew said that the Old Street roundabout carried a massive amount of traffic, and that the proposals there were not aimed entirely at cyclists but to benefit everyone, including pedestrians and tube passengers. He was of the view that although not absolutely 100% perfect, it will certainly make cycling safer and be substantially better than is currently the case. Gilligan admitted that there would be fewer benefits for cyclists than if the scheme was entirely aimed at cyclists, but that it was not entirely aimed at cyclists because the vast majority of people using the junction don’t cycle. It exemplifies the principle that the roads are operated in the interests of everybody, and not just cyclists. Would you send a policy note to all London authorities saying that all new road schemes must score at least 70% on the Cycling Level of Service scale? This came from a resident of Tower Hamlets, and Andrew’s reply was “We have a limited ability to enforce such a requirement, but I’ll have a look at that”. Why aren’t children included in TfL’s inclusive cycling campaign? Not sure who asked this, but the concise reply Andrew gave was “They are!”. Which handle are you lurking behind on Twitter? This was cheekily asked by Kevin Hickman (@psykyln), to which Gilligan cheekily replied that he was not on Twitter (or any kind of social media) as life was too short! He went on to say that if he used Twitter, he would spend his entire time fending off tweets from the likes of David Hembrow (@DavidHembrow) and “people like that”. Then, knowing that Vincent Stops (@VincentStops) was in the audience, added “and perhaps Vincent too”. I think that both David and Vincent should take this as a compliment! Once again in 2015, the Hackney Cycling Conference proved to be a very useful and enjoyable event. It was good to see two Sutton councillors, Councillor Hanna Zuckowska, Wandle Valley, (@hanna_zuckowska) and Councillor Manuel Abellan, Beddington South, (@Cllr_m_abellan), in attendance at this fourth annual cycling conference in Hackney. Manuel said he had attended in 2014 too. Given that there has been no representation from Sutton Council at the first two conferences, the Hackney Cycling Conference 2015 was a record year for Sutton! There is more on Andrew Gilligan’s speech from Laura Laker (@Lakerlikes) at road.cc (@roadcc): London cycling commissioner: “Cycle superhighways came close to not happening”. Hackney Council (@hackneycouncil) have an overview of the event in Hackney Cycling Conference: Why Cycling is the future, and presentations from the event can be downloaded from Hackney Cycling Conference. Proper standard of provision on the Quietways is good to know, of course. But are we getting it right from the outset? Probably not. There has subsequently been some potentially disheartening news about Quietways with the publication by TfL on 18 June of its consultation report on proposals for the junction of Tower Bridge Road/Rothsay Street/Webb Street in Southwark (part of the Waterloo to Greenwich Quietway, managed by TfL). An option to signalise the junction (i.e. do it properly and avoid pedestrian/cyclist conflict), had been designed and fully assessed. However, the report notes, is not being taken forward “as the results indicated that delays would be incurred to all road users on Tower Bridge Road, the Inner Ring Road”. Was it ever thus? Meanwhile, the early stages of the upgrade to Cycle Superhighway 2 around Aldgate East appear to have resulted in a severe reduction in the width of pavements, pavements that carry heavy footfall. “Cyclists” have been observed speeding behind “floating bus-stops” with little care for people on foot. Doing things properly (subjective)? Proper standard of provision (objective)? New money, old thinking? Expecting too much too soon? Discuss. It’s very disappointing that Andrew is attempting to discredit me. I can only assume that this is because he knows that my criticisms of London’s cycling policy under his reign are based in fact. It seems discrediting is his preferred way to react rather than engaging in a genuine dialogue about what the problems are that kill an absurdly large number of the few who dare to cycle in London, and seeking real fixes for those problems.